"Delicious with or without tortilla chips!" 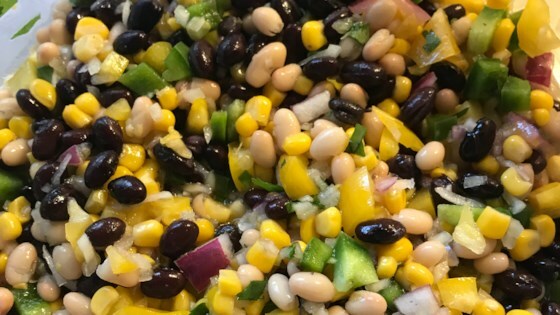 Combine black beans, corn, black-eyed peas, celery, red bell pepper, and green onion in a large bowl. Whisk sugar, vinegar, oil, and black pepper together in a saucepan; bring to a boil until sugar is dissolved, about 5 minutes. Remove from heat and cool. Pour cooled dressing over vegetable-bean mixture; stir to coat. Refrigerate for 8 hours or overnight. Drain excess liquid before serving. A sweet, tangy, spicy fresh summer salsa! Awesome. Full of unique flavor! Love the black eyed peas in this! I left out the celery and used a fresh jalapeno. Delicious as a salad or with chips. Have made this three times and it was a hit every time. The only change I made was I omitted the black eye peas and I used a half cups of sweet onion instead of green onions. Very tasty. I did add extra vinegar because we like it more sour than sweet. Might be good with a bit of taco seasoning too. great side dish with pork chops. I omitted the celery, added tomatoes, jalapenos and used shoe peg corn. very nice. we loved it. good with chips or right out of the bowl. Made this for a family cookout and all I heard all night was this is sooooo good!! The family liked it in the chips but also were just eating it out of a bowl. Definitely one to make again. I love, love, love this recipe. Would not change a thing. Serve it with Tostido cups and it is a perfect appitizer at parties. It's addictive!